Home Watch Service Plus of the Kenai Peninsula, Alaska, earns seventh-year accreditation from the NHWA! I am pleased to announce that Home Watch Service Plus of the Kenai Peninsula, in Soldotna, Alaska, has earned Accredited Member status from the NHWA for the seventh year. Owner Stace Escott’s involvement in the Home Watch industry began while living on Amelia Island, Florida. Yes…he moved from Florida to Alaska. In Florida, Stace was as an award-winning Director of the Year for an upscale retirement community. While he was Osprey Village’s Director of Facility Services, Stace gained a vast amount of experience by implementing policies and overseeing an operation that affected the residents’ day-to-day lifestyle and enjoyment. 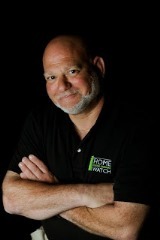 In addition to Stace’s facilities management, 10 years in law enforcement/loss prevention prompted him to seek out an opportunity through Home Watch Service Plus to bring that same peace and quality of life to members of the public. (He is currently employed as a Sergeant for the Soldotna Police Department). As a Director of Facility Services, Stace planned, directed, organized and supervised the maintenance for equipment, buildings and grounds of a large upscale retirement campus. He provided overall supervision for all maintenance and housekeeping personnel, and projects pertaining to each department, as well as renovating numerous homes and construction projects. Stace also gained professional experience in project management. With his very impressive background, Stace is the right man to be looking out for his clients on the Kenai Peninsula. Stace’s wife, Brigette, is also a key part of the business. She has her Associate’s Degree in Psychology and is working on her Bachelor’s Degree. They have been residents of Alaska for over 20 years. Home Watch Service Plus of the Kenai Peninsula serves Soldotna, Sterling, and Kenai. Stace can be reached at (907) 252-4431 or at bsescott@yahoo.com. Learn more at www.HomeWatchServicePlus.com/kenai.